IRVINE, CA, Nov 1, 2016 – CGTech is now shipping the next major release of VERICUT Composite Applications: VERICUT composite programming (VCP), VERICUT composite simulation (VCS) and VERICUT composite paths for engineering (VCPe). VERICUT Composite Applications are being used by leading manufacturers to program and simulate automated fiber placement and tape-laying machinery from machine tool builders such as, Electroimpact, MTorres, Fives, BA Composites and others. 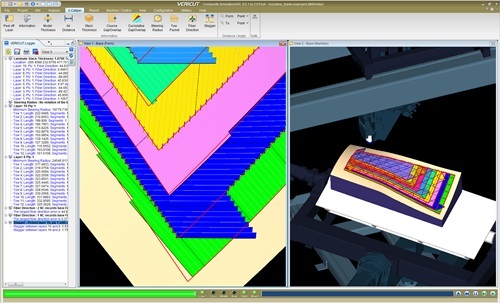 Many new features have been added in version 8.0, including enhanced support for AFP/ATL hybrid machines, more ways to utilize laser inspection data, display detailed scrap calculations, and other vital analysis tools. A complete list of enhancements is available on the cgtech.com website. VCPe gives the user the ability to measure and evaluate the effects of AFP and ATL path trajectory, material steering, surface curvature, course convergence and other process constraints as they would be applied in manufacturing. The software also provides produceability analysis of the fiber angle based on the curvature of the part, and overlap and gaps needed for structural analysis. Tape course geometry can be written to various CAD formats for further evaluation by the user’s existing analysis methods and tools. VCP reads CATIA V5, STEP, or ACIS surface models. It also reads Fibersim, CATIA V5 or other external ply geometry and information. VCP then adds material to fill the plies according to user-specified manufacturing standards and requirements. Layup paths are linked together to form specific layup sequences and are output as NC programs for the automated layup machine. Headquartered in Irvine, California, CGTech specializes in numerical control (NC/CNC) simulation, verification, optimization and analysis software technology for manufacturing. Since 1988 CGTech’s product, VERICUT software, has become the industry standard for simulating CNC machining in order to detect errors, potential collisions or areas of inefficiency. CGTech also offers machine-independent off-line programming and simulation software for automated fiber-placement and tape-laying CNC machines. With offices worldwide, VERICUT software is used by companies of all sizes, universities/trade schools, and government agencies. For more information, visit the CGTech website at cgtech.com, call (949) 753-1050, or email info@cgtech.com.